It’s travel time, people. Spring Break is coming up, then summer and the next thing you know—BAM—the holidays. This means you need to be prepared if you drop dead, or barf a lot, or poop your pants, when you eat gluten. Any of those. I’m heading to Minneapolis today to check out General Mills and what they’re laying down (Hint: it’s Gluten-Free Cheerios!!!!!!!!) so I’m packing all these goodies up in case I need some safe foods. Yes, it is a lot. And no, I probably won’t need it all since General Mills is taking care of gluten-free me and other GF peeps. Still, I do love carrying a sandwich around with me. 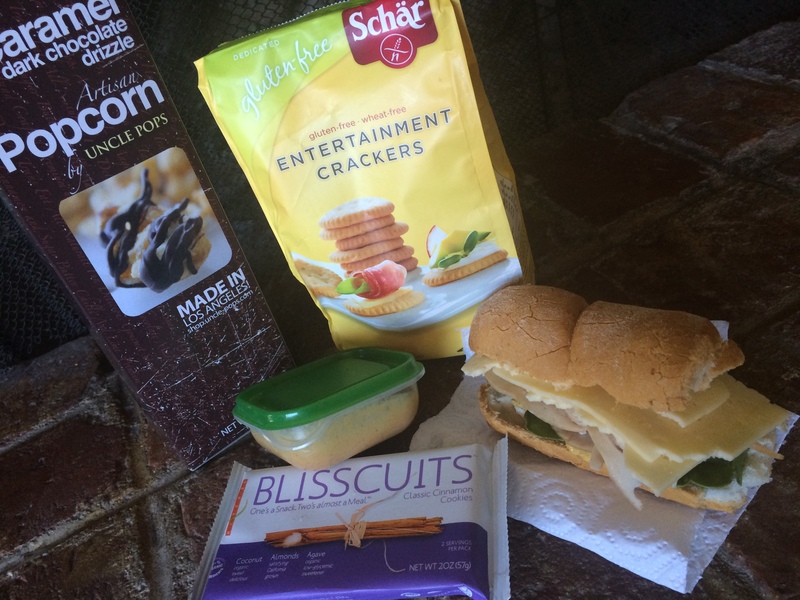 Here’s what’s good here: Schar’s new Entertainment Crackers do entertain. For sures. They’re going to entertain this side of nut butter all the way into my mouth. Udi’s French baguette makes for a rad sub, which can also be used in a gluten-free Snackadium. Mmmm, Havarti and smoked turkey…. This new popcorn situation I’ve never seen but it says it’s gluten-free, and most popcorn products are (most, not all, check those labels ya’ll!). And these Blisscuits cinnamon cookies I found at Yummy.com are also looking delicious. I’ll report in via Instagram if that assumption is correct. So head out prepared, my people. The one time I took off without an insane amount of gluten-free food, well, that was the one time gf goodness was scarce and everything was dipped in soy sauce and wrapped in a deep-fried flour tortilla. You don’t want to find yourself in that situation. No way, no how. And don’t forget you can always supplement with fruits and vegetables if you get desperate, and/or you’re healthier than I.
GLUTEN-FREE CHEERIOS!!!!!!!!!!! More on that later. Tags: celiac disease, gluten free snacks, gluten free travel. Bookmark the permalink. Love your blog & book – and agree that if you’re traveling, you have to pack for the worst case situation. But check the labeling on the Blisscuits ….”*BLISSCUITS™ CONTAIN EGGS, COCONUTS, ALMONDS AND MILK. Made on equipment in a facility that processes Eggs, Peanuts, other Tree Nuts, Milk and Wheat.” Aaaarghhhh!!! OK, that last word was all me. Because these look delish. Awwww, crap. Well, I did not eat them yet so I think I’m going to skip unless I find myself on a deserted island with only gluten to eat.